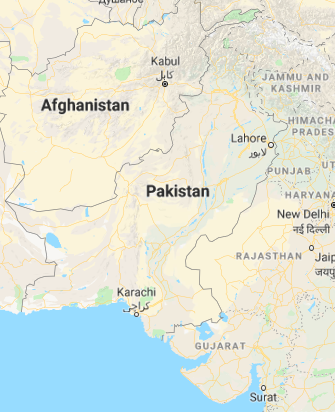 “Pakistan.” Map. Google Maps. Google, 31 Oct. 2018. Web. 31 Oct. 2018. Rafat is an immigrant who was born and raised in Hyderabad, Pakistan where she received her advanced degree in dentistry before she came to the United States in 1976. During her interview, Rafat wore traditional Pakistani clothing made up of three pieces called the shalvar, the chamise, and the duputa. Rafat and her sisters were taught to cover their body with the duputa,which is a piece of clothing similar to a shawl.This is why Rafat encourages her own daughters to wear the duputa , especially to special occasions, such as weddings. Rafat explaines that traditional Pakistani clothing is “really sparkly” with “a lot of embroidery and beadwork.” She adds that Pakistani women have adopted saris from the Indian culture and that the three piece attire still remains similar today but there is much more variation in colors and styles. She is especially careful with the clothing her mother and grandmother passed down to her and still continues to wear them on a daily basis. Passing down her clothing to her daughters and granddaughters is important to Rafat because she wants them to have a connection with family. She feels that it also serves as a connection and a reminder so that her daughters will not easily forget where they came from. Fozia is a first generation Muslim woman who immigrated to the United States at seventeen years old from Islamabad, Pakistan. Fozia has lived in both the United States and Pakistan throughout her life, but she now considers America her homeland because she’s spent a majority of her life here. Fozia related to us the importance of traditional Pakistani dress to her and told us that she wears the shalwar and the chamise regularly, especially when she is socializing within the Pakistani community. Fozia gets her clothing from Pakistan when she goes to visit and has been wearing them since she was a teenager. She says that she feels very comfortable when she wears her traditional clothing.Throughout the years, Fozia notices the changes that traditional Pakistani clothing has gone through and recognizes the modern influence as well as the Indian influence on Pakistani clothing. She enjoys passing these pieces of her heritage down to her daughters and they, in turn, enjoy receiving them. Lena was born and raised in Pakistan where she attended school and college to earn her master’s degree in Sociology. Her interview focused primarily on cultural clothing and the importance of keeping tradition during weddings through the attire of the bride and groom wear. During her interview, Lena was wearing a chamise, shalvar, and duputa which is the three piece outfit traditionally worn. Another dress Pakistanis wear is called a sari, which is one long cloth that is wrapped around and can cover one’s head. Those are the two main dresses, but for a wedding the bride wears a different dress. Both of Lena’s daughters had their weddings in Pakistan, and Lena described their wedding dresses as “very traditional”. One dress is called a ligha, which is a loose skirt with a long shirt and the scarf on the head. Another dress is called a guerrara which has two loose legs as a bottom piece, with a short shirt and “the duputa. Lena described the detailed embroidery on the dress which makes them very “unique and sparkly.” The man also wears something similar to women’s clothing, which is an all-white shalvar chamise. Lena said “we feel at home when we are wearing these dresses,” and they play a role in keeping her connected to her homeland.